Stand with the feet hip-width apart with the hands over the level of the kidneys with the thumbs facing forward and down with the fingers pressing into the deepest aspect of your lumbar spine. Pay attention to the length and width of your feet, then lift and spread your toes away from the floor. Hold the toes up, but just enough so that you can press the first and fifth metatarsal heads into the support surface. Fill up the abdominal container by widening into your thumbs and pressing your spine back into your finger-tips, without any gross movement of the spine. Let this be the controlling principle. 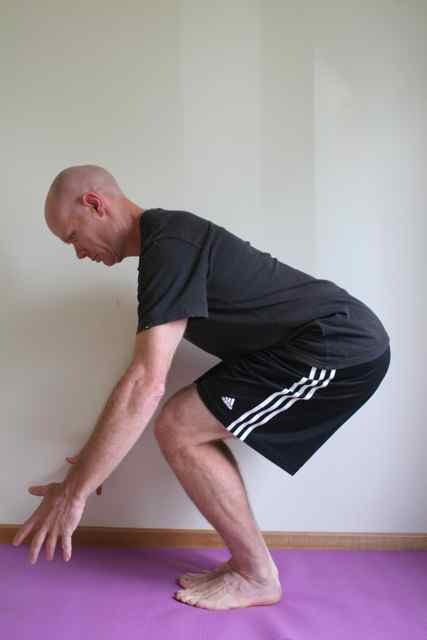 Send the shins forward, knees forward and away and track the angle of shins and trunk with a long spine. Pay attention to 3 points of support at the feet, and particularly the front metatarsal heads. Follow this down, stopping at any barriers to the movement and breathing. It is very important to be aware of every millimeter of how you are lowering the body by feeling the feet and keeping the trunk symmetrical. Follow this down to the limit of your symmetry and hold the bottom position and breathe. Over time, this bottom position will improve, with this comes the improvement in your function, alignment and symmetry.